Hollywood's parade of unoriginality marches on this weekend with vigor, but in comparisons to last weekend's “NO DO NOT WANT” we have more of a “...huh?” situation with a couple of our new releases this time around. 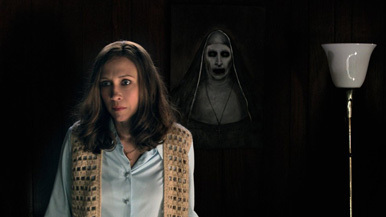 Probably the only one of the three new wide releases that anyone is truly enthusiastic about, The Conjuring 2 follows up 2013's surprise horror hit and James Wan's proof that he had a second trick up his sleeves. Based on the “real” stories of paranormal investigator husband and wife team the Warrens, The Conjuring 2 puts them back into a haunted house situation, attempting to find the story behind a poltergeist that seems to be haunting a young girl – this time in London. Patrick Wilson and Vera Farmiga once again do battle with what the movie assumes to be the Devil (I'm gonna guess in the movie universe, it ain't Ol' Mr. McGillicuddy). While the story isn't anything new and it's essentially covering the same territory as The Exorcist, what it does have going for it is an especially effective presentation, with the some of the creepiest ads in some time. That, more than anything, is going to be the deciding factor for what can be a very fickle audience – one that's sent only four movies over even the low hurdle of $50 million in the last two years. Horror fans like what they like until they don't like it anymore, which is something that Wan is very familiar with through his Saw series, but a phenomenon he's come through the other side of safely. These films and their relative classicism could be seen as a reaction to the Paranormal Activity/found footage wave that swept through horror for about a decade, and burned out almost completely. With these being films that Wan basically tosses off in between blockbuster tentpoles, Wan very definitely has had the last laugh about the death of that earlier horror franchise. The first Conjuring film managed a $41 million opening, and this may be able to build off that figure, to around $45 million to start.